It’s funny how the Camino will work its magic if you let it. I’m not sure how many days we’ve been walking…7 or 8, you tend not to bother counting when you spend your day just putting one foot in front of the other and enjoying the journey. I think things have clicked for Pat today and in a way, it’s a pity that our journey is just a short one. We were very lucky leaving Arzua this morning in that we were behind the main waves of pilgrims, so we’ve had a very peaceful day of walking with not many other pilgrims on the track. 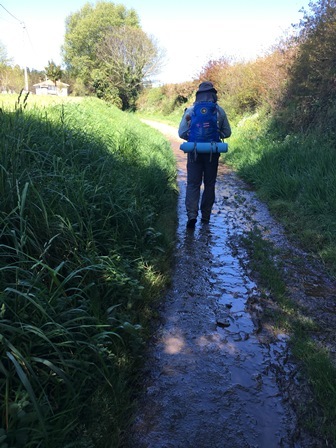 I think that; coupled with walking through some beautiful eucalypt forests, has really helped Pat connect with the Camino and all that it can offer. She’s even saying it’s a pity we’re only walking 16 kilometres today and it’s a pity that we stop walking tomorrow once we reach Santiago. So I think she really appreciates that to get the full Camino experience or benefit from walking the Camino, you do actually need to walk a little bit longer than just 7 or 8 days. It’s not about distance in my view, it’s about the number of days on the road. 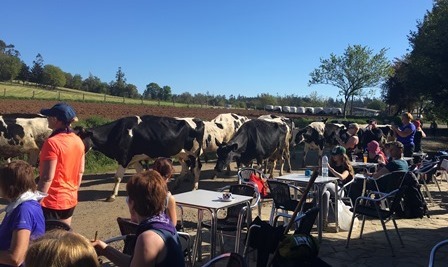 She’s also talking about not only walking another Camino, but actually walking the Camino Frances again starting in Saint Jean, doing the full 800 kilometres, Oh dear, what have I created! Well done both of you. Try the coastal route next time Rob ? We were up at 5am on our last day to get to Santiago for the midday pilgrim’s mass. Pat got to see the thirible swing first time…. What an Awesome conclusion to the walk. Well done!